We provide our Sydney clients with a range of quality Polished Concrete options to ensure all our clients’ needs are both appealingly and functionally met. Specialising in commercial and industrial projects throughout Australia, PCM PTY.LTD is equipped with several teams of large 3 phase concrete grinding machines and ride on concrete polishing machines to maximise production, while reducing down time to allow your project to continue with minimal disruption. We ensure the best outcome, as inappropriate floor preparation prior to the polishing will affect the overall finish of your floor. Without using the correct preparation steps you may well end up with a concrete floor that will in the long run cost you time, money and resources. Polishing concrete are popular in all types of establishments, including homes, because they require little maintenance. PCM turn the surface of a concrete floor into a shiny, slip resistant surface, adding style to your property. Colour can be matched to the interior’s décor. 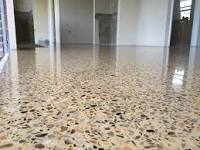 PCMPTY.LTD are the leading team for concrete floor polishing in Sydney, so give us a call today to discuss your concrete flooring needs or to gather concrete polishing prices.